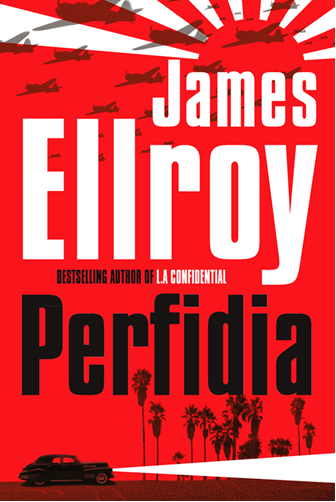 Perfidia has been out for a while now and many James Ellroy fans will have read it and formed a judgment. Personally, I thought it was a strong novel and an improvement on its predecessor Blood’s a Rover (2009), but reading what the other critics have said makes me think I’m in the minority. Don’t get me wrong, plenty of critics praised the book. It’s just that the praise felt a bit muted and the criticism more prolonged than Ellroy has come to expect. I wonder if this is the beginning of critical opinion turning against Ellroy. I think that would be an over-reaction, but to give you a sense of what I mean, I’ve compiled an overview of the mixed comments that came from reviewers. while the endless and uncomfortable racial epithets feel true to the times and the men who utter them, the ceaseless “outing” of rumored homosexuals grows monotonous and, worse, predictable. Before I even saw the “Roosevelt” that followed “Eleanor,” I knew reference would be made to her rumored homosexual tendencies, and it was. Same went for Barbara Stanwyck and Cary Grant. The effect isn’t revelatory; it’s puerile. On Amazon the reader reviews have been more unambiguously positive, with one reviewer comparing Ellroy’s work favourably to Walter Scott’s Waverley novels. Surely the biggest compliment a historical novelist could hope for. Great novelists disappear so that their characters no longer seem to partake in their creator’s sensibilities but instead become real unto themselves and thus to the reader. But Ellroy cross-infects his cast list with such similar traits and strains that they begin to flatten into collage rather than come forward as people. The baffling contradiction of Ellroy’s persona is that he can criticise his past work in a way that bolsters his confidence about the new novels. Forshaw states that Ellroy ‘disowned’ The Cold Six Thousand (2001) before Blood’s a Rover was released. In a recent interview with Craig McDonald at the Iowa City Book Festival, Ellroy emphatically stated that his second novel Clandestine, which features Dudley Smith and references to the Black Dahlia case, does not fit into his new larger Quartet narrative. I wonder why any author would be so scathing of their past work when they’ll always be critics happy to do that for you, and what does it do to your sales when potential readers think you don’t believe in your own work? The answer, I suspect, is that for Ellroy no standards of writing are too high. He’s already reinvented the genre several times, but with Perfidia and the Second LA Quartet, he’s come back for one more go.